This is Judas Priest's second album, released in 1976. 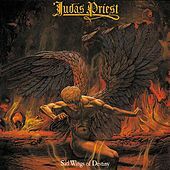 With floating psychedelic moments pushed up against the nascent heavy metal the band was still in the process of pioneering, Sad Wings of Destiny may not be the benchmark that their next record, Sin After Sin, was to be just one year later. Still, it does have "The Ripper," which has Rob Halford sounding like the type of Broadway villain you just can't get enough of. "Genocide" and "Tyrant" became concert staples in their own right, but you might want to pass over "Dream Deceiver."